On 19 Dec 15, Vertical Horizonz New Zealand (VHNZ) signed a two year partnership with Arabian Training and Safety (ATS) Co LLC Oman. The aim of the partnership is to offer ATS delegates (clients) level 3 and 4 Industrial safety training courses to a recognised unit standard and provide the opportunity to Up Skill ATS Instructors. The first ATS Up Skilling Course conducted by VHNZ was a success. Stow lifting equipment and prepare the truck and crane for road transport. This is the first time ATS instructors have prepared, moved and placed a load using different slinging configurations, directing the load using hand signals and operating the crane controls themselves. A couple of comments from the Instructors on the course, "one of the best courses I have attended". Six ATS instructors completed and passed the course. 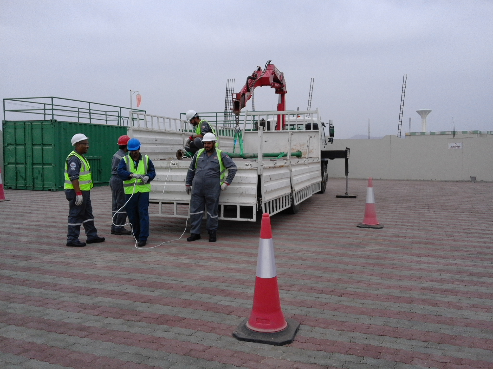 They are the first Omani based ATS Instructors to receive the New Zealand Qualification Authority (NZQA) Unit Standard 16617 for "Use a truck loader crane to lift and place loads". VHNZ looks forward to offering level 3 and level 4 courses to ATS and there delegates focusing on Professional Development, Industrial Safety, Crane Safety, Transportation and Health and Safety. The next Up Skilling for the ATS Instructors is the Mobile Elevated Work Platform followed by a Train the Trainer Course. Andrew Cockburn is on the ground to support the Middle East Regional Training Manager in Oman. Andrew will conduct the Train the Trainer Course which concludes on 31st March 2016. Being on the ground for just over seven weeks covering Abu Dhabi and Oman is definitely a challenge, as the pace is very different to what I am use too. However, as they say, when in Rome!!. A pleasing note is, there are opportunities in both countries for the company and our partners and I am confident the pace and momentum will pick up as we continue to promote VHNZ in the Middle East.